Matariki is coming up. The Seven Sisters (also known as the Pleiades star cluster) have reappeared in the night sky. If you happen to be up on a clear pre-dawn morning you can spot the Sisters low in the North-East sky. Matariki falls on the day of the first New Moon after the Sisters return. 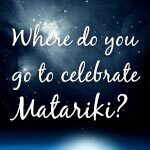 This year Matariki is on Saturday the 4th of June. Click here to watch a 3 part video on Matariki. What else can you find out to share with the class?